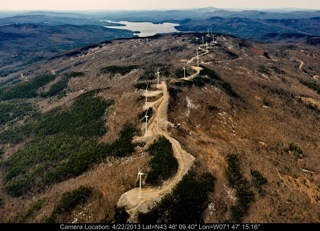 A planned wind project that consists of 19 GE model 1.5 MW wind turbines with 65-meter (213’) towers, 77-meter (252’)diameter rotors and ancillary systems, on Bakke Mountain in Florida and Crum Hill in Monroe, Massachusetts. The project will interconnect to the new 69/34.5kV substation through a new collection system for a total capacity of 28.5 MW. BOND has been contracted to clear the site and construct turbine access roads. Subsequent phases will include: turbine platforms and foundations, retaining walls, drainage systems, DC/AC collection systems, and the electrical substation. Tags: Hoosac Wind. Bookmark the permalink.